Author(s): Qian Liu, Xiaoyong Yi, Xiaomeng Hu. Department of Urology, Tianjin First Central Hospital, 24 Fukang Road, Tianjin, P. R. China, 300192. Self-assembling peptides have very recently emerged as a new class of drug vehicles, as they hold unique advantages such as good biocompatibility, design flexibility, and controllable nanotructure. In this work, we report a self-assembling peptide containing D-amino acids (Nap- GDFDFDYGRGD) as the carrier of anticancer drug tetrandrine. Tetrandrine is a bis-benzylisoquinoline alkaloid isolated from the root of Hang-Fang-Chi (Stephania tetrandra S. Moore). The D-peptides were employed in this study as they have shown stronger resistance against proteases than their Lcounterpart with natural L-amino acids. 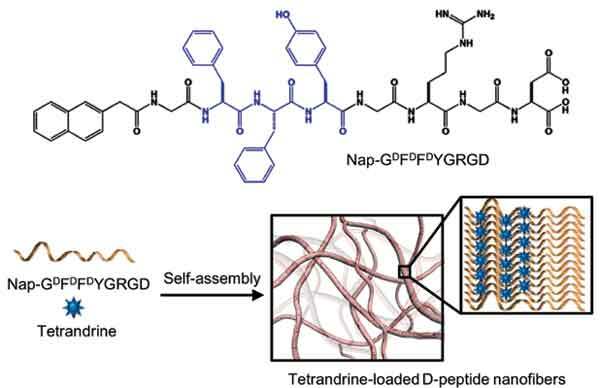 The Nap-GDFDFDYGRGD peptides can self-assemble into nanofibers, which are able to efficiently encapsulate tetrandrine. The drug-loaded nanofibers are capable of sustained release of tetrandrine and being internalized by the LoVo cancer cells. The cytotoxicity studies indicate that the tetrandrine-loaded nanofibers possess similar cytotoxicity to free tetrandrine against LoVo cancer cells and the Nap- GDFDFDYGRGD nanofibers can be used as a safe vehicle. Keywords: D-Amino acid, drug carrier, drug delivery, peptide, self-assembly, tetrandrine. Affiliation:Department of Urology, Tianjin First Central Hospital, 24 Fukang Road, Tianjin, P. R. China, 300192. Keywords:D-Amino acid, drug carrier, drug delivery, peptide, self-assembly, tetrandrine. Abstract:Self-assembling peptides have very recently emerged as a new class of drug vehicles, as they hold unique advantages such as good biocompatibility, design flexibility, and controllable nanotructure. In this work, we report a self-assembling peptide containing D-amino acids (Nap- GDFDFDYGRGD) as the carrier of anticancer drug tetrandrine. Tetrandrine is a bis-benzylisoquinoline alkaloid isolated from the root of Hang-Fang-Chi (Stephania tetrandra S. Moore). The D-peptides were employed in this study as they have shown stronger resistance against proteases than their Lcounterpart with natural L-amino acids. The Nap-GDFDFDYGRGD peptides can self-assemble into nanofibers, which are able to efficiently encapsulate tetrandrine. The drug-loaded nanofibers are capable of sustained release of tetrandrine and being internalized by the LoVo cancer cells. The cytotoxicity studies indicate that the tetrandrine-loaded nanofibers possess similar cytotoxicity to free tetrandrine against LoVo cancer cells and the Nap- GDFDFDYGRGD nanofibers can be used as a safe vehicle.